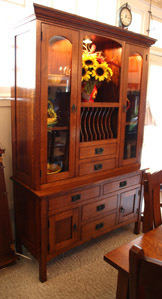 Let Us Help You Design A Custom Piece Of Furniture For Your Home. COME SEE THE DIFFERENCE QUALITY MAKES! Are you still looking for something different, bigger or smaller? Need to fill a space? Bring your ideas and measurements to the store and let our experienced staff assist you in designing the CUSTOM FURNITURE of your dreams. We work with many select species of wood, including: OAK, BIRCH, CHERRY, MAPLE, HICKORY, WALNUT AND MANY MORE! Come experience our new furniture design center!